More than 2 000 silver items made by Russia’s finest jewellers and valued at more than $2 million; are being shown at the Tsarskoye Selo palace, one of the former residences of the tsars that is now a museum. The trove of silver, including a tea set, ornamental figures, trays and cutlery; once belonged to the aristocratic Narshykin family, one of the country’s richest, who were forced to flee abroad after the 1917 Revolution. “A discovery of this sort is extremely rare: a treasure trove that is complete, that all belonged to the same family and is very well preserved. It’s unique,” said Olga Taratynova, the head of the Tsarskoye Selo palace museum. The hidden collection was discovered by accident in 2012 during repair work on the city centre mansion. Builders broke through a brick wall and found a secret room containing packing cases full of treasure. Local media reported that the builders tried to steal the silver, but were caught red-handed. In 2012, the Russian state handed the whole trove to the Tsarskoye Selo museum. The collection was in near-perfect condition because it was stored carefully wrapped in newspaper and tissue paper soaked in acetic acid. 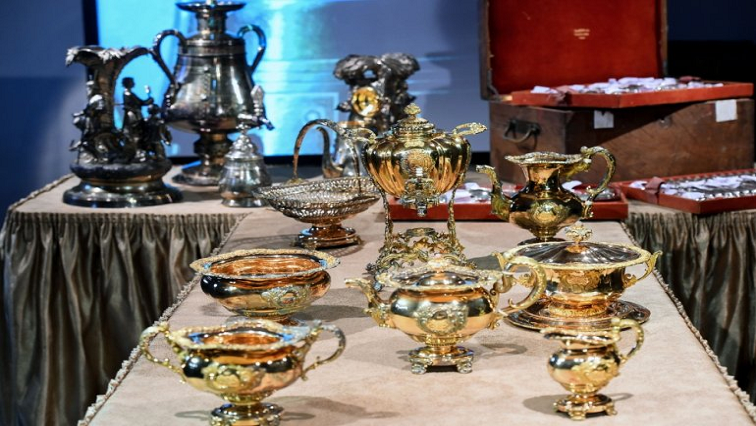 “At the time, all these were objects of everyday use for one of the richest families of Russia,” said Taratynova, describing the silver as of “enormous artistic value,” particularly the tea set, which was made by the jewellers of the royal court. The post Long-lost treasure of Russian aristocrats displayed for first time appeared first on SABC News – Breaking news, special reports, world, business, sport coverage of all South African current events. Africa's news leader..